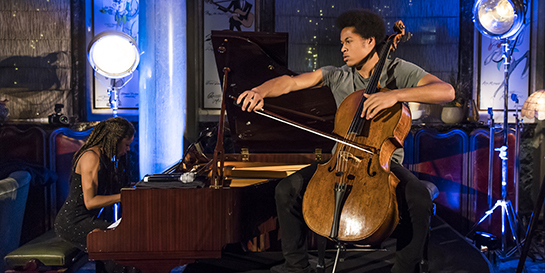 Sheku Kanneh-Mason unveiled his debut album Inspiration at an intimate Christmas celebration for media and special guests at London’s Rosewood Hotel this week. Accompanied on piano by his sister Isata Kanneh-Mason, Sheku played a small selection of pieces to get everyone in the festive spirit. He performed two songs from his new album, which were broadcast live on Facebook, as well as a cover of Bob Marley's No Woman No Cry, which is now confirmed as a priority track for next month. The event was presented by BBC’s Clemency Burton-Hill who hosted a Q&A with Sheku, delving deeper into Sheku’s inspirations, the making of the album, and his family’s musical talent. Sheku began to play the cello at the age of six, after attending a concert in Nottingham. By the time he was nine, he had achieved Grade 8 and earned the top marks in the country. Since then he has won numerous awards, including BBC Young Musician of the Year and the Southbank Breakthrough Award – following in the footsteps of previous winners Stormzy, Tom Hiddleston and Billie Piper. The cellist can now count Stephen Fry, Eddie Redmayne and Prince Harry among his famous fans. Among the guests were designer Paul Smith, Sheku’s older brother Braimah Kanneh-Mason (who plays with Clean Bandit), and fellow musicians Guy Johnston and Chi-chi Nwanoku, founder of Chineke! orchestra – Europe’s first majority BME orchestra. The event successfully created interest in the album, with multiple interviews locked in for the run up to release. Inspiration was also one of the highlights of Apple Music’s Christmas party, who will further support the album with promotion across their home page. Sheku Kanneh-Mason’s performance in Birmingham in November has been listed as one of the top 10 classical performances of 2017 in the Observer New Review, in print and online. Last year’s Sheku-focused documentary, Young, Gifted and Classical: The Making of a Maestro, is once again available on iPlayer until Sunday, and is a pick in The Independent’s i News. Lots is planned around the release of the album, particularly in his hometown of Nottingham where half his album was recorded, so be sure to keep an eye out!